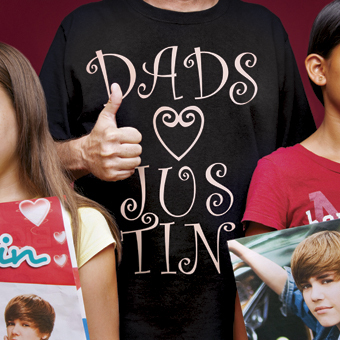 How to get in touch with your inner schoolgirl at a Justin Bieber concert. The Skyline Chili restaurant at Fourth and Sycamore was packed with Reds fans enjoying dinner before the team squared off with the Cleveland Indians. Even though I find sitting through nine innings something worthy of Amnesty International’s attention, I wished I was going to the game. But no, I had something even more painful awaiting me: Justin Bieber, the 16-year-old pop phenom, performing at U.S. Bank Arena. I ate my four-way while my teen daughter, Maggie, and her friend (who I’ll call Jenny), sat opposite me, eating their cheese coneys and texting friends who were living vicariously through them. It was going to be a long night. I ordered a beer and sipped it slowly, knowing it was my one and only for the evening but fantasizing that it was the first of many. For those not up on the teeny-bopper music scene—and as anachronistic as it may sound, I think “teeny-bopper” is the right word to describe the current crop of pop artists ululating on radios and MP3 players nationwide—Justin Bieber is a pure confection of our digital culture. He achieved stardom initially because his mother was proud (and smart) enough to videotape his at-home jam sessions and talent show appearances and post them on YouTube. From there, this cute kid with talent to burn—he can sing; he can dance; and he can play several instruments—went “viral.” His videos attracted more than a million hits, something typically reserved for established stars, or cats that can play the piano while smoking a pipe. With such a following, Bieber soon had an agent, the mentorship of Usher, and a record contract with Island Def Jam, the label that reps Mariah Carey, Bon Jovi, and Melissa Etheridge. Four songs from Bieber’s first album, My World, released last November, made the Top 40 of the Billboard Hot 100 before the album was even released, a record for a solo artist’s debut. His meteoric rise from online star to recording and performance artist was so swift and life-changing, my daughter Maggie informed me, that it required the hiring of a “swagger coach.” Smelling a dubious claim, I looked into it and discovered it’s true. A guy named Ryan Good helps Bieber perfect his presentation and style. Or as Bieber explained to the Kansas City Star: “[My swagger coach] teaches me different swaggerific things to do.” Hmm. I come from a school of thought that says if you need a swagger coach, you’ll never be truly swaggerific. You can’t learn cool; God knows I’ve tried. Swagger aside, with talent, some street cred, and a memorable hairstyle (think a ’70s feather cut but in reverse, with the “feathers” flowing to the front and across his forehead), Bieber rules the pages of Tiger Beat—which you may be surprised and mildly appalled to discover is still around. He’s even publishing a book this month. When you’re 16 and already there is a demand for your words in book form, you must be doing something right, even if it involves connecting to the hearts of lovesick ’tweens. Whether Bieber’s career will quickly implode, like most teen idols (see David Cassidy, Leif Garret, et al. ), or slowly inflate only to inexorably (and spectacularly) deflate, like Michael Jackson’s, only time will tell. I would bet on the former if only because the chances of there being another Michael Jackson are infinitesimal—which, let’s face it, is both bad news and good news. It was a Reds fan enjoying a pregame meal with his son. “Sure am,” I said, and tried to manage a smile, while Maggie and Jenny lit up and nodded enthusiastically. “I feel your pain,” the man said. “I had to go to a Miley Cyrus concert earlier this year.” He then laughed one of those better-you-than-me laughs. The girls kept walking, their enthusiasm certainly not dampened by the remarks of an “old guy” (who was 10 years my junior). I turned back to the man and whispered, “Take me with you.” He laughed that laugh even harder. Our brief stroll to the arena was one of sidewalks crowded with giggling girls and side streets lined with dozens of limousines. Evidently, some parents opted to make the night even more memorable for their daughters by renting limos, which, it jealously occurred to me then, would allow the chaperones to drink heavily. The thought of renting a limo had not crossed my mind. That’s partly because I shelled out over $100 for each of our three very fine seats, which were seven rows from the floor and four sections from the stage. To pay face value would have meant camping out at a Ticketmaster location the night (or two) before the morning the tickets went on sale. Or I could have tried to out-dial tens of thousands of ’tweens that morning in an attempt to reach Ticketmaster during the seven-minute window before all the tickets were gone. I would have faced better odds playing “Horse” against LeBron James. Once we found our seats I noticed that this event was almost entirely a mother-daughter outing. There were only a small handful of us dads and only a few more boys, some of whom appeared genuinely interested in the show, though most seemed there against their will (at least that’s what they would have you believe). One kid really stood out, and that’s because, according to Maggie, he’d won a local radio station’s Bieber look-alike contest. As he wandered around the arena, girls were actually mistaking him for the real deal. Several mini stampedes occurred as girls rushed screaming out of their seats toward the faux Bieber. At first, the look-alike seemed to be enjoying all the attention. But soon this small taste of teen idol-dom became tiresome and it was clear that he would have rather been shooting baskets, playing his Wii, or reading comic books. But maybe I was just projecting. Maggie and Jenny had their pic taken with the look-alike and returned to their seats where they waved to friends they could see and texted those they couldn’t. The anticipation was palpable, and the arena was filled with a constant hum reminiscent of the infamous vuvuzelas that drowned out every other sound during the World Cup soccer matches. Several human “waves” made their way around the arena. After just a few minutes of that, the crowd clearly grew bored and the waves became more like splashes, then drips. But then the lights dimmed and the screaming grew so loud and the pitch so high that dogs as far north as Mason had to be able to hear it. An audible letdown was noticeable when not Bieber but the first of three—God help us—warm-up acts took the stage: The Stunners (an all-gal, Spice Girls–like group), followed by the child model-turned-singer Jessica Jarrell, and finally the “main” opener, Jamaican-American rapper Sean Kingston. One thing that I give Bieber’s management credit for is diversity. Virtually all of the performers that night, including the Bieb’s band and dancers, were people of color. His four back-up singers are a Filipino-American band known as Legaci, who were also discovered on YouTube. I’m not sure this rainbow coalition registered with Maggie and Jenny since their world, especially their musical world, is already pretty diverse. About the most diverse thing in my childhood musical landscape besides The Jacksons was ABBA. You’ve come a long way, Bieber. Bieber began his show around 9 o’clock, after they’d reset the stage. It felt like midnight to me, but I got on my feet with Maggie, Jenny, and 10,000 other little schoolgirls and screamed like, well, a little schoolgirl. The din from all of us screaming chicks made hearing him nearly impossible. That wasn’t that big of a deal since I wasn’t all that familiar with his oeuvre. Yet. After the show, so that I could better limn his Beiberness, I did a bit of listening. I even watched an hour-long TV special in which I learned several things, including how Bieber once stepped out of his limo to hug a fan and was shocked when she tried to kiss him. He thought it was a sign of disrespect. Or just read some of the comments that fans post online. Here’s one that, scarily, is not the least bit atypical, and it comes from a girl whose handle is “Future Ms. JB”: justin i know alot of girls tell u they love u but i actually mean it i love u like i have never loved anyone b 4 when i listen to ur songs and look at ur posters i tune everyone else around me out and i love u with all my heart i cant stop thinking bout u u run through my head all day and i cant get u out no matter how hard i try so i love u justin and i really do mean everything i say about u! i love u justin bieber! He’s lucky the girl outside his limo didn’t try to rip his underwear off. Anyway, as much as I didn’t want to like the show, I have to admit that I found it rather entertaining, particularly the dancing and the reaction of all the love-struck fans. Several times during the show, Bieber stepped into a contraption that lifted him above the crowd, carried him to the other end of the arena, and then back to the stage. In one instance, he perched in a metal frame shaped like a heart. It was pretty hokey, and I remember thinking, I can’t believe Maggie would fall for this. One thing that I hoped she would fall for was a video PSA that played on the jumbo screens about mid-way through the show in which Bieber urged his fans not to text and drive. This was definitely music to my ears since Maggie is a recent recipient of a temporary driver’s license and I really don’t want to increase my blood pressure any more. So, thank you, Justin. After the obligatory encore, the show ended and we made our way back to the car. My ears were ringing, but I could tell that the concert clearly lived up to Maggie’s and Jenny’s expectations. Then on the drive home, without any prompt from me, Maggie said, “That heart thing was really cheesy.” Reader, my heart swelled with pride. She hadn’t turned over her common sense to the teen heartthrob after all, even if he does have a swaggerific haircut. “Yeah, that was pretty cheesy,” I said, my voice scratchy from all the screaming.